Both the men and women’s soccer team faced Grace College this past Saturday. The men’s team were able to take a point away from the game after a 1-1 tie, but the women fell 6-0 to the Lady Lancers. After losing their conference opener to Bethel earlier in the week, the men’s soccer team hosted the Lancers who came into this matchup receiving votes in the national rankings. The game started off with the majority of the action taking place in the midfield, but neither side was able to generate a scoring opportunity until the ninth minute of action. Lancer goalkeeper Kurt Hamlin would save a header from center back Tevin Gilkes to prevent the Maple Leafs taking the lead. As the half came to a close the Lancers ricochet two shots off of the crossbar. Minutes later Grace’s Cody Boerema was able to send the ball into the back of the net following a rebound from Brayton Taylor’s shot in the 41st minute. Grace would keep Goshen off the board for the remainder of the half, taking a 1-0 lead into the break. In less than a minute into the second half, Goshen’s Johan Escalante was called into action to keep the Lancers lead to one. As the game progressed, so did the physicality. Each side finished the game with 16 fouls. Grace received four yellow cards and Goshen’s three. As emotions ran high, Goshen seemed to generate fewer chances until the 69th minute. Senior, Nate Nussbaum was able to create space for himself 30 yards away from the goal. Nussbaum switched the ball to his right foot and took a shot that rocketed into the back of the net past the outstretched hands of Hamlin to achieve the equalizer. As neither team could provide a second goal at the end of regulation, the game went into overtime. The first period of overtime brought in four of the games seven yellow cards and a total of three shots, two from Grace and one from Goshen. All squared at one apiece the game went to a second overtime period. Grace took three shots all of which had to be saved by Escalante who finished the game with a total of 10 saves. Both teams pressed hard in the closing minutes looking to take the lead, but no goals would be scored. After 110 minutes of action, both teams were able to secure a point with the scoreline remaining 1-1. With the tie, Goshen moves to 5-5-1 overall and 0-1-1 in the conference. 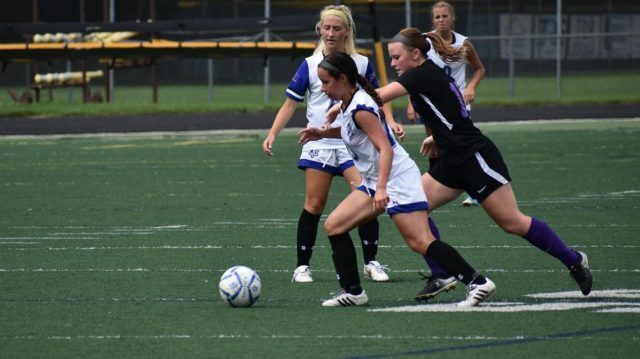 The Women’s soccer team also played the Lancers on Saturday as they traveled to Winona Lake. Goshen College struggled in the match to get any sort of offense going. The Lancers got on the scoreboard first and would never look back. The goal came in he sixth minute from Kristen Bellinger. Goshen hung in with Grace for a while until the Lancers scored their second goal in the 33rd minute from Joana Schimmel. In the second half, Grace continued to dominated the Maple Leafs in every facet of the game. They outshot Goshen 21-1 and were able to generate three corner kicks to Goshen’s zero. Grace would score four more times in the second half with the third coming from a penalty kick. The game ended 6-0 with Grace out shooting the Maple Leafs 30-3. Each team saw 20 players take the field with first-year Ella Jantzen making her collegiate debut. With the loss, Goshen’s record falls to 4-3-2 overall and 0-2 in conference play. Both teams look to secure their first conference win of the season this Wednesday, Oct. 3. against Taylor University. The men’s team host the Trojans at the John Ingold Athletic Complex, whist the women travel to Upland for the match. Kick-off for both games is set at 7 p.m.